You may have already seen a bunch of tutorials on how to style the range input. While this is another article on that topic, it's not about how to get any specific visual result. Instead, it dives into browser inconsistencies, detailing what each does to display that slider on the screen. Understanding this is important because it helps us have a clear idea about whether we can make our slider look and behave consistently across browsers and which styles are necessary to do so. Before anything else, we need to make sure the browser exposes the DOM inside the range input. 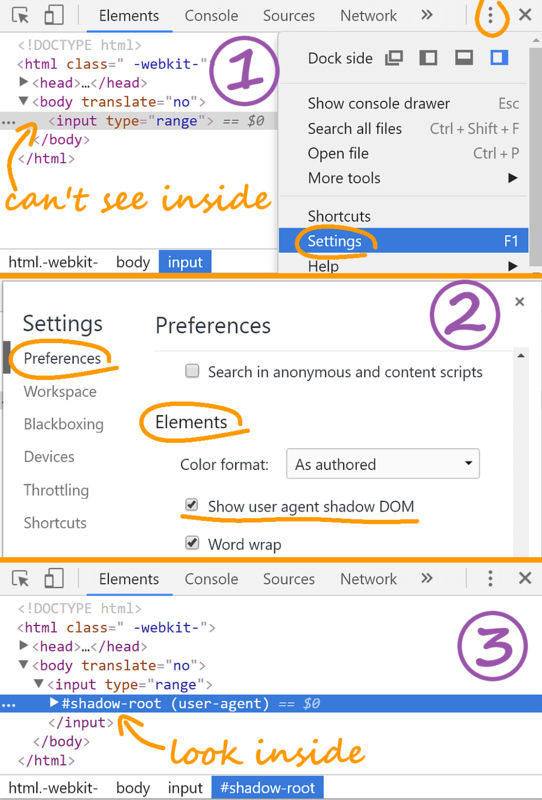 In Chrome, we bring up DevTools, go to Settings, Preferences, Elements and make sure the Show user agent shadow DOM option is enabled. Sequence of Chrome screenshots illustrating the steps from above. 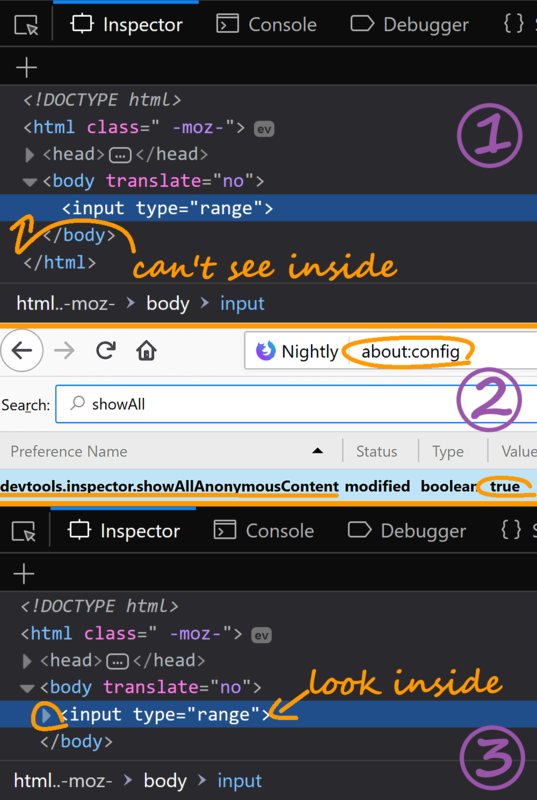 In Firefox, we go to about:config and make sure the devtools.inspector.showAllAnonymousContent flag is set to true. Sequence of Firefox screenshots illustrating the steps from above. For a very long time, I was convinced that Edge offers no way of seeing what's inside such elements. But while messing with it, I discovered that where there's a will and (and some dumb luck) there's a way! 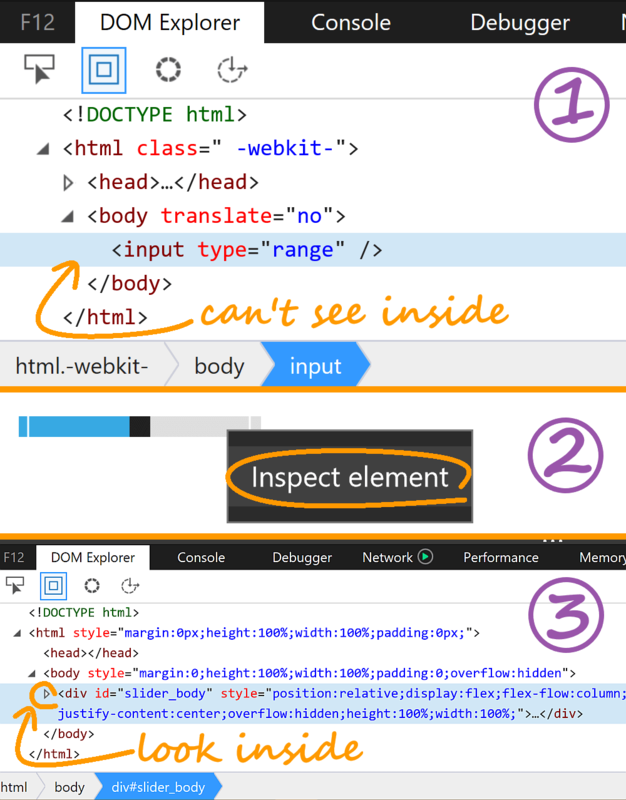 We need to bring up DevTools, then go to the range input we want to inspect, right click it, select Inspect Element and bam, the DOM Explorer panel now shows the structure of our slider! Sequence of Edge screenshots illustrating the steps from above. Apparently, this is a bug. But it's also immensely useful, so I'm not complaining. Right from the start, we can see a source for potential problems: we have very different beasts inside for every browser. In Chrome, at the top of the shadow DOM, we have a div we cannot access anymore. This used to be possible back when /deep/ was supported, but then the ability to pierce through the shadow barrier was deemed to be a bug, so what used to be a useful feature was dropped. Inside this div, we have another one for the track and, within the track div, we have a third div for the thumb. These last two are both clearly labeled with an id attribute, but another thing I find strange is that, while we can access the track with ::-webkit-slider-runnable-track and the thumb with ::-webkit-slider-thumb, only the track div has a pseudo attribute with this value. 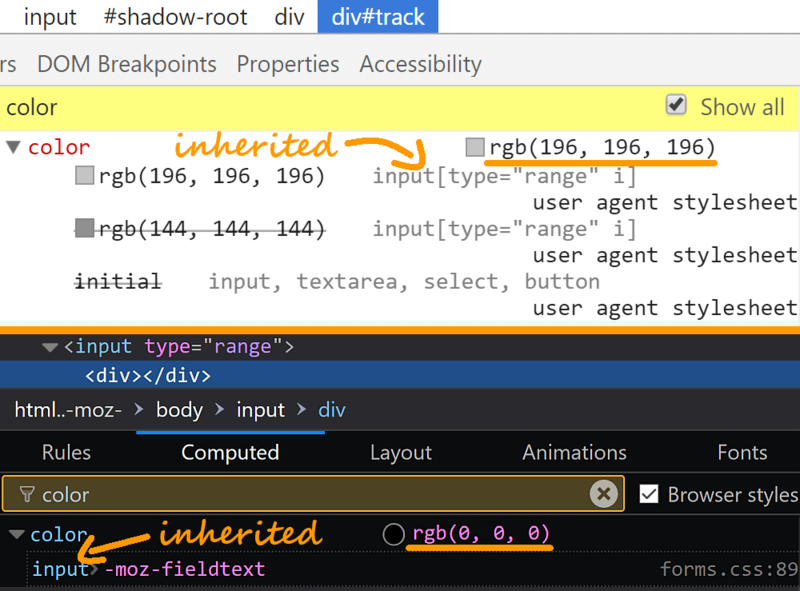 In Firefox, we also see three div elements inside, only this time they're not nested - all three of them are siblings. Furthermore, they're just plain div elements, not labeled by any attribute, so we have no way of telling which is which component when looking at them for the first time. 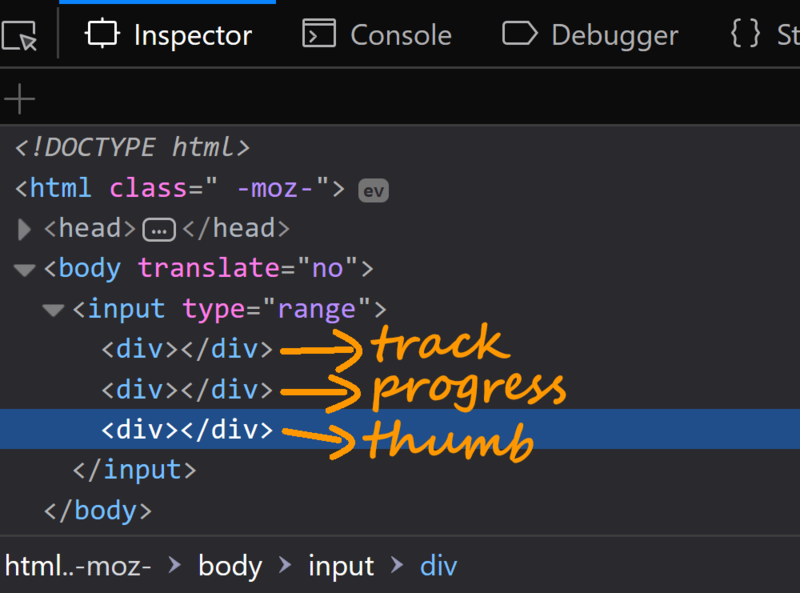 Fortunately, selecting them in the inspector highlights the corresponding component on the page and that's how we can tell that the first is the track, the second is the progress and the third is the thumb. We can access the track (first div) with ::-moz-range-track, the progress (second div) with ::-moz-range-progress and the thumb (last div) with ::-moz-range-thumb. The structure in Edge is much more complex, which, to a certain extent, allows for a greater degree of control over styling the slider. 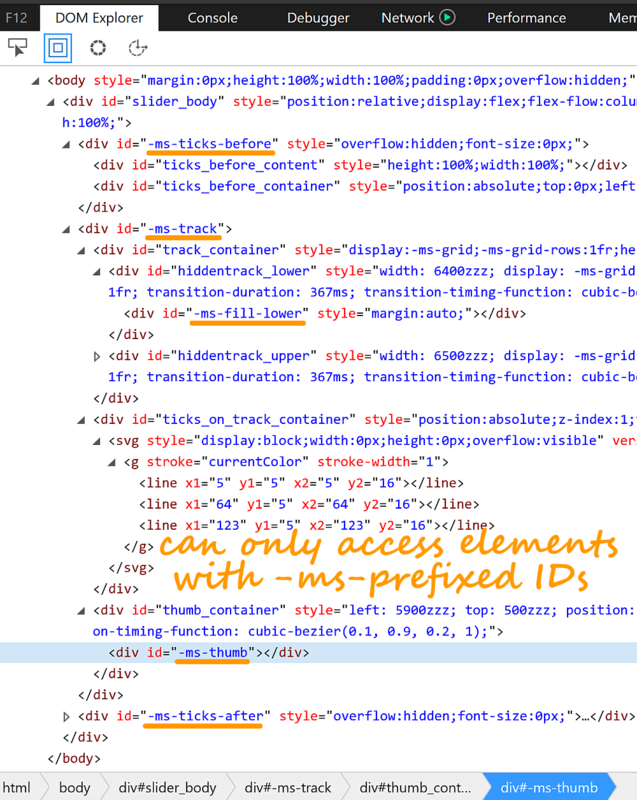 However, we can only access the elements with -ms- prefixed IDs, which means there are also a lot of elements we cannot access, with baked in styles we'd often need to change, like the overflow: hidden on the elements between the actual input and its track or the transition on the thumb's parent. Having a different structure and being unable to access all the elements inside in order to style everything as we wish means that achieving the same result in all browsers can be very difficult, if not even impossible, even if having to use a different pseudo-element for every browser helps with setting individual styles. We should always aim to keep the individual styles to a minimum, but sometimes it's just not possible, as setting the same style can produce very different results due to having different structures. For example, setting properties such as opacity or filter or even transform on the track would also affect the thumb in Chrome and Edge (where it's a child/ descendant of the track), but not in Firefox (where it's its sibling). But that's a lot of repetition and a maintainability nightmare. This is what makes the mixin solution the sanest option: we only have to write the common styles once so, if we decide to modify something in the common styles, then we only need to make that change in one place - in the mixin. Note that I'm using Sass here, but you may use any other preprocessor. Whatever you prefer is good as long as it avoids repetition and makes the code easier to maintain. Next, we take a look at some of the default styles the slider and its components come with in order to better understand which properties need to be set explicitly to avoid visual inconsistencies between browsers. Just a warning in advance: things are messy and complicated. 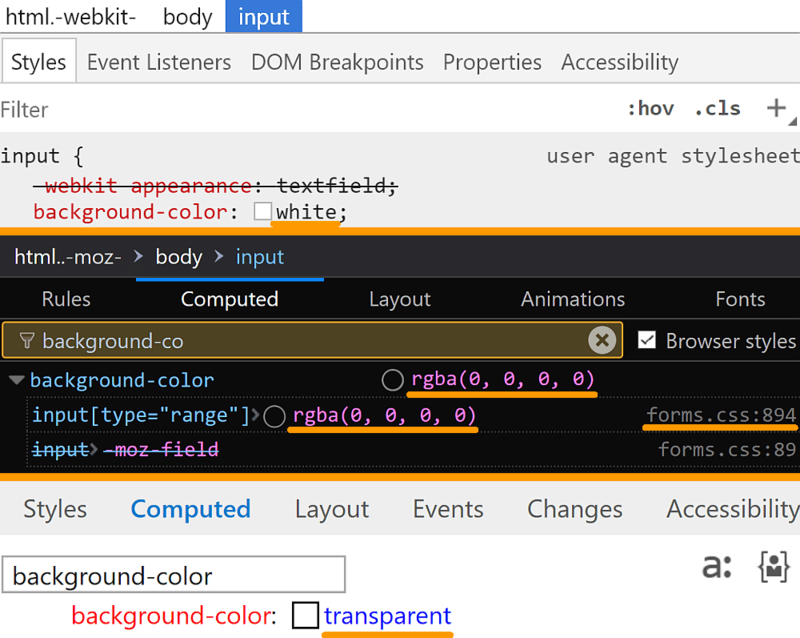 It's not just that we have different defaults in different browsers, but also changing a property on one element may change another in an unexpected way (for example, when setting a background also changes the color and adds a border). WebKit browsers and Edge (because, yes, Edge also applies a lot of WebKit prefixed stuff) also have two levels of defaults for certain properties (for example those related to dimensions, borders, and backgrounds), if we may call them that - before setting -webkit-appearance: none (without which the styles we set won't work in these browsers) and after setting it. The focus is going to be however on the defaults after setting -webkit-appearance: none because, in WebKit browsers, we cannot style the range input without setting this and the whole reason we're going through all of this is to understand how we can make our lives easier when styling sliders. Note that setting -webkit-appearance: none on the range input and on the thumb (the track already has it set by default for some reason) causes the slider to completely disappear in both Chrome and Edge. Why that happens is something we'll discuss a bit later in this article. 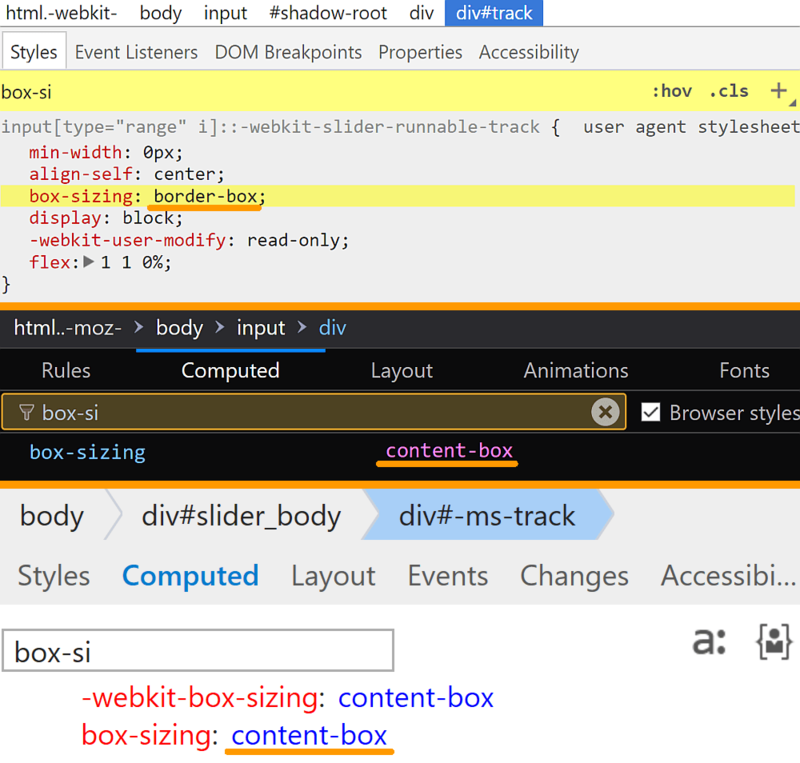 The first property I've thought about checking, box-sizing, happens to have the same value in all browsers - content-box. 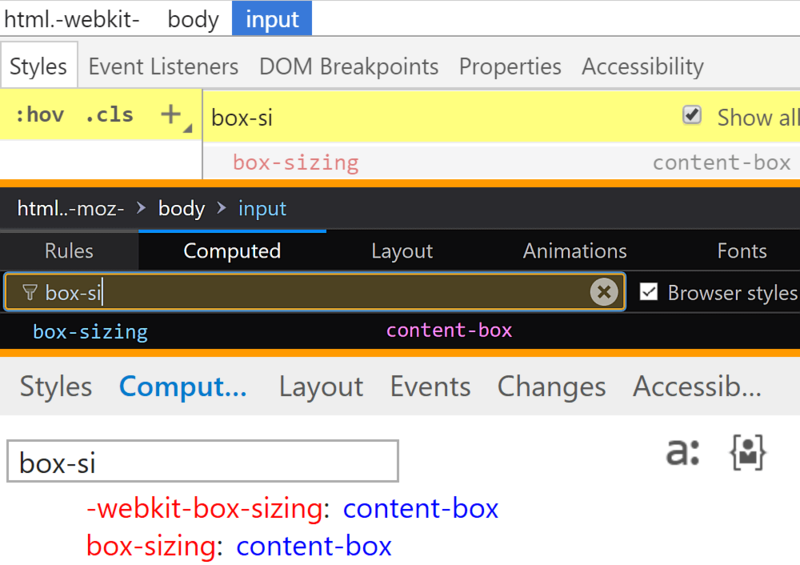 We can see this by looking up the box-sizing property in the Computed tab in DevTools. The box-sizing of the range input, comparative look at all three browsers (from top to bottom: Chrome, Firefox, Edge). Sadly, that's not an indication of what's to come. This becomes obvious once we have a look at the properties that give us the element's boxes - margin, border, padding, width, height. By default, the margin is 2px in Chrome and Edge and 0 .7em in Firefox. Before we move on, let's see how we got the values above. The computed length values we get are always px values. However, Chrome shows us how browser styles were set (the user agent stylesheet rule sets on a grey background). Sometimes the computed values we get weren't explicitly set, so that's no use, but in this particular case, we can see that the margin was indeed set as a px value. 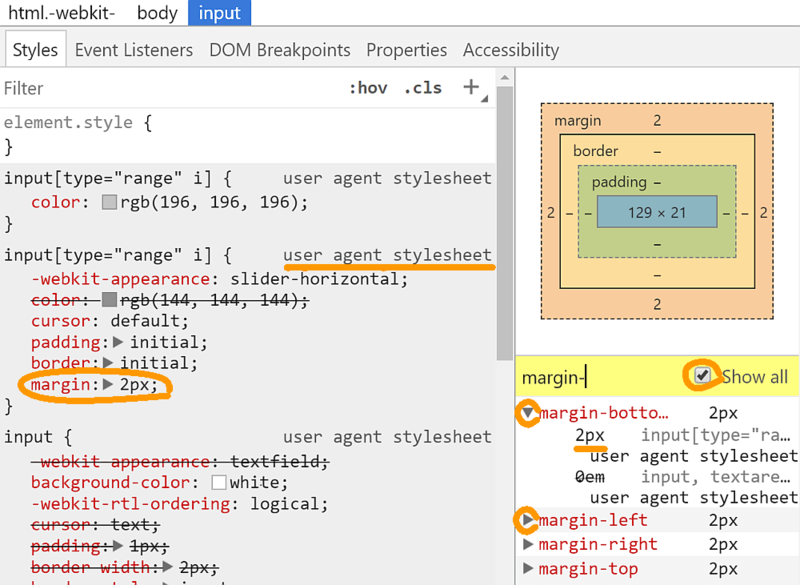 Tracing browser styles in Chrome, the margin case. 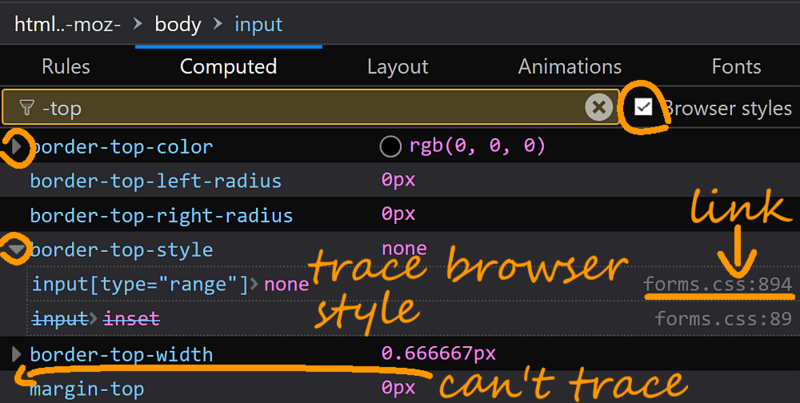 Tracing browser styles in Firefox and how this fails for the margin of our range input. When changing the font-size on the input or on the html, which entails is was set as an em or rem value. When changing the viewport, which indicates the value was set using % values or viewport units. This can probably be safely skipped in a lot of cases though. Changing the font-size of the range input in Firefox also changes its margin value. The same goes for Edge, where we can trace where user styles come from, but not browser styles, so we need to check if the computed px value depends on anything else. Changing the font-size of the range input in Edge doesn't change its margin value. In any event, this all means margin is a property we need to set explicitly in the input[type='range'] if we want to achieve a consistent look across browsers. Since we've mentioned the font-size, let's check that as well. Sure enough, this is also inconsistent. First off, we have 13.3333px in Chrome and, in spite of the decimals that might suggest it's the result of a computation where we divided a number by a multiple of 3, it seems to have been set as such and doesn't depend on the viewport dimensions or on the parent or root font-size. The font-size of the range input in Chrome. 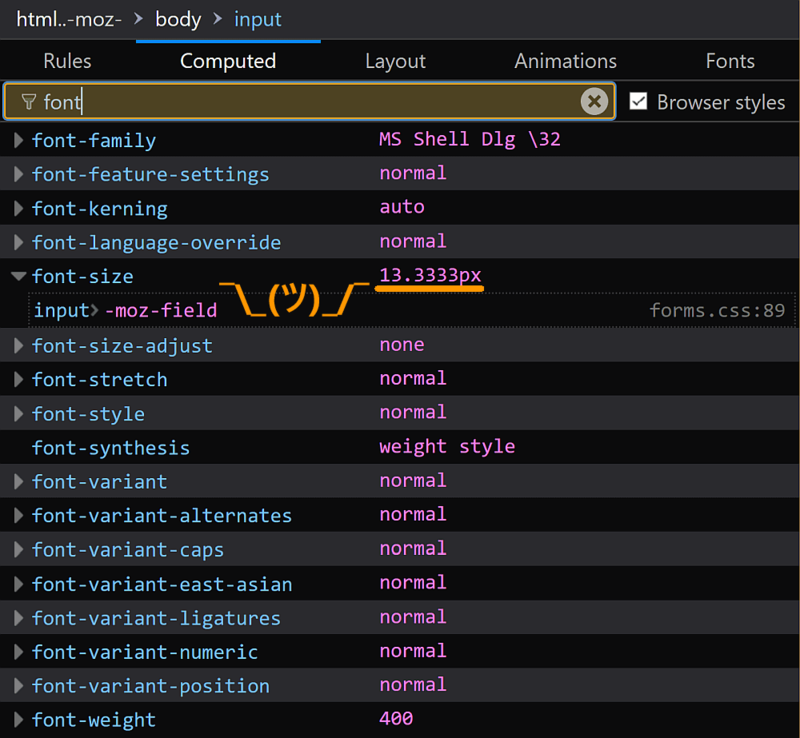 Firefox shows us the same computed value, except this seems to come from setting the font shorthand to -moz-field, which I was first very confused about, especially since background-color is set to -moz-Field, which ought to be the same since CSS keywords are case-insensitive. But if they're the same, then how can it be a valid value for both properties? Apparently, this keyword is some sort of alias for making the input look like what any input on the current OS looks like. The font-size of the range input in Firefox. The font-size of the range input in Edge. This is important because we often want to set dimensions of sliders and controls (and their components) in general using em units so that their size relative to that of the text on the page stays the same - they don't look too small when we increase the size of the text or too big when we decrease the size of the text. And if we're going to set dimensions in em units, then having a noticeable font-size difference between browsers here will result in our range input being smaller in some browsers and bigger in others. For this reason, I always make sure to explicitly set a font-size on the actual slider. Or I might set the font shorthand, even though the other font-related properties don't matter here at this point. Maybe they will in the future, but more on that later, when we discuss tick marks and tick mark labels. Before we move on to borders, let's first see the color property. In Chrome this is rgb(196,196,196) (set as such), which makes it slightly lighter than silver (rgb(192,192,192)/ #c0c0c0), while in Edge and Firefox, the computed value is rgb(0,0,0) (which is solid black). We have no way of knowing how this value was set in Edge, but in Firefox, it was set via another similar keyword, -moz-fieldtext. The color of the range input, comparative look at all three browsers (from top to bottom: Chrome, Firefox, Edge). The border is set to initial in Chrome, which is equivalent to none medium currentcolor (values for border-style, border-width and border-color). How thick a medium border is exactly depends on the browser, though it's at least as thick as a thin one everywhere. In Chrome in particular, the computed value we get here is 0. The border of the range input in Chrome. 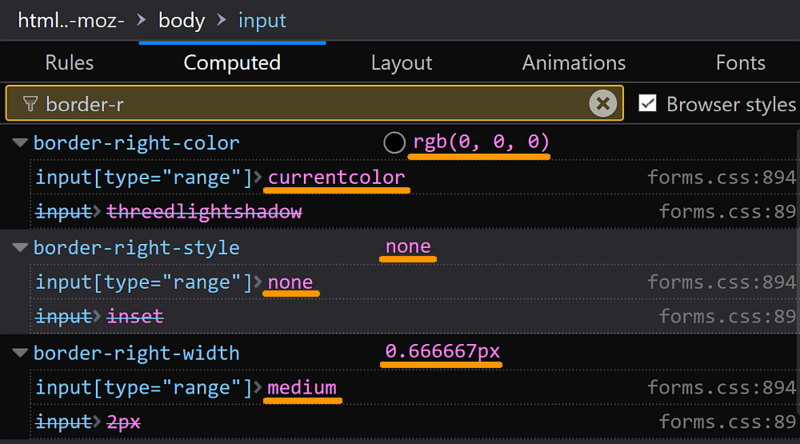 In Firefox, we also have a none medium currentcolor value set for the border, though here medium seems to be equivalent to 0.566667px, a value that doesn't depend on the element or root font-size or on the viewport dimensions. The border of the range input in Firefox. We can't see how everything was set in Edge, but the computed values for border-style and border-width are none and 0 respectively. The border-color changes when we change the color property, which means that, just like in the other browsers, it's set to currentcolor. The border of the range input in Edge. The padding is 0 in both Chrome and Edge. The padding of the range input, comparative look at Chrome (top) and Edge (bottom). However, if we want a pixel-perfect result, then we need to set it explicitly because it's set to 1px in Firefox. The padding of the range input in Firefox. Now let's take another detour and check the backgrounds before we try to make sense of the values for the dimensions. Here, we get that the computed value is transparent/ rgba(0, 0, 0, 0) in Edge and Firefox, but rgb(255,255,255) (solid white) in Chrome. The background-color of the range input, comparative look at all three browsers (from top to bottom: Chrome, Firefox, Edge). And... finally, let's look at the dimensions. I've saved this for last because here is where things start to get really messy. Chrome and Edge both give us 129px for the computed value of the width. Unlike with previous properties, we can't see this being set anywhere in Chrome, which would normally lead me to believe it's something that depends either on the parent, stretching horizontally to fit as all block elements do (which is definitely not the case here) or on the children. There's also a -webkit-logical-width property taking the same 129px value in the Computed panel. I was a bit confused by this at first, but it turns out it's the writing-mode relative equivalent - in other words, it's the width for horizontal writing-mode and the height for vertical writing-mode. Changing the font-size of the range input in Chrome doesn't change its width value. In any event, it doesn't depend on the font-size of the input itself or of that of the root element nor on the viewport dimensions in either browser. Changing the font-size of the range input in Edge doesn't change its width value. Firefox is the odd one out here, returning a computed value of 160px for the default width. This computed value does however depend on the font-size of the range input - it seems to be 12em. Changing the font-size of the range input in Firefox also changes its width value. In the case of the height, Chrome and Edge again both agree, giving us a computed value of 21px. 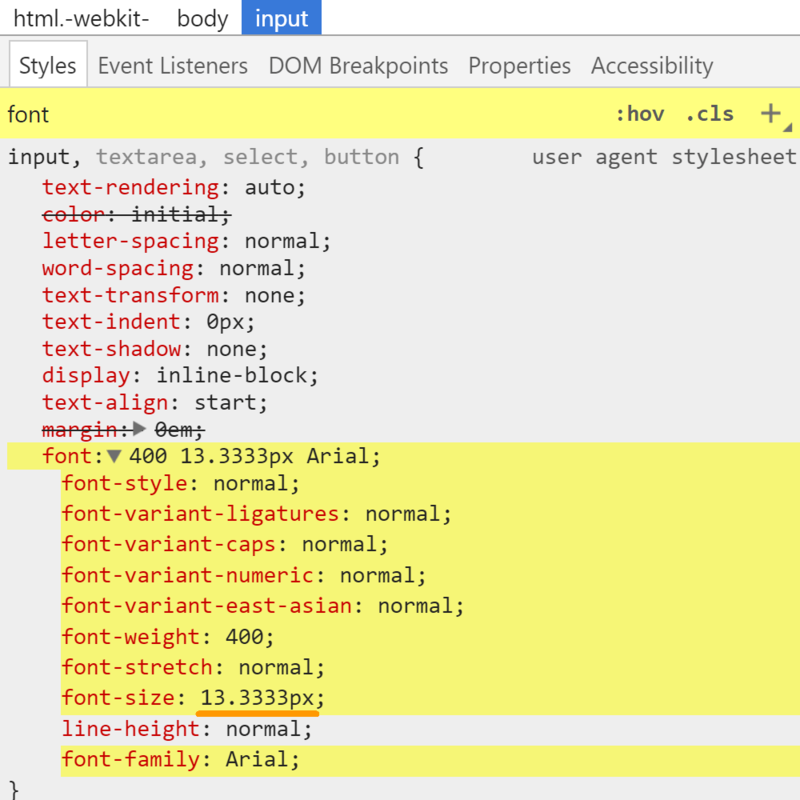 Just like for the width, I cannot see this being set anywhere in the user agent stylesheet in Chrome DevTools, which normally happens when the height of an element depends on its content. Changing the font-size of the range input in Chrome doesn't change its height value. This value also doesn't depend on the font-size in either browser. Changing the font-size of the range input in Edge doesn't change its height value. Firefox is once again different, giving us 17.3333px as the computed value and, again, this depends on the input's font-size - it's 1.3em. Changing the font-size of the range input in Firefox also changes its height value. But this isn't worse than the margin case, right? Well, so far, it isn't! But that's just about to change because we're now moving on to the track component. There's one more possibility regarding the actual input dimensions that we haven't yet considered: that they're influenced by those of its components. So let's explicitly set some dimensions on the track and see whether that influences the size of the slider. Apparently, in this situation, nothing changes for the actual slider in the case of the width, but we can spot more inconsistencies when it comes to the track width, which, by default, stretches to fill the content-box of the parent input in all three browsers. 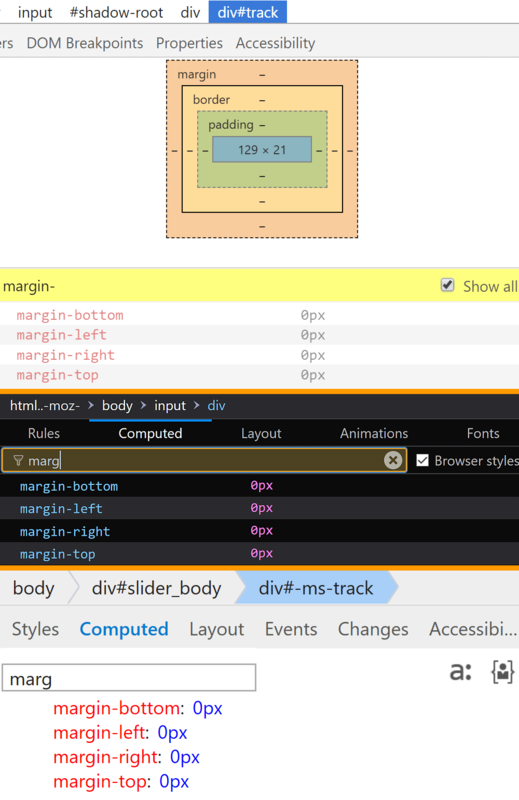 In Firefox, if we explicitly set a width, any width on the track, then the track takes this width we give it, expanding outside of its parent slider or shrinking inside, but always staying middle aligned with it. Not bad at all, but, sadly, it turns out Firefox is the only browser that behaves in a sane manner here. Explicitly setting a width on the track changes the width of the track in Firefox, but not that of the parent slider. In Chrome, the track width we set is completely ignored and it looks like there's no sane way of making it have a value that doesn't depend on that of the parent slider. Changing the width of the track doesn't do anything in Chrome (computed value remains 129px). As for insane ways, using transform: scaleX(factor) seems to be the only way to make the track wider or narrower than its parent slider. Do note doing this also causes quite a few side effects. The thumb is scaled horizontally as well and its motion is limited to the scaled down track in Chrome and Edge (as the thumb is a child of the track in these browsers), but not in Firefox, where its size is preserved and its motion is still limited to the input, not the scaled down track (since the track and thumb are siblings here). Any lateral padding, border or margin on the track is also going to be scaled. Moving on to Edge, the track again takes any width we set. Edge also allows us to set a track width that's different from that of the parent slider. This is not the same situation as Firefox however. While setting a width greater than that of the parent slider on the track makes it expand outside, the two are not middle aligned. Instead, the left border limit of the track is left aligned with the left content limit of its range input parent. This alignment inconsistency on its own wouldn't be that much of a problem - a margin-left set only on ::-ms-track could fix it. However, everything outside of the parent slider's content-box gets cut out in Edge. This is not equivalent to having overflow set to hidden on the actual input, which would cut out everything outside the padding-box, not content-box. Therefore, it cannot be fixed by setting overflow: visible on the slider. This clipping is caused by the elements between the input and the track having overflow: hidden, but, since we cannot access these, we also cannot fix this problem. Setting everything such that no component (including its box-shadow) goes outside the content-box of the range is an option in some cases, but not always. For the height, Firefox behaves in a similar manner it did for the width. The track expands or shrinks vertically to the height we set without affecting the parent slider and always staying middle aligned to it vertically. Explicitly setting a height on the track changes the height of the track in Firefox, but not that of the parent slider. The default value for this height with no styles set on the actual input or track is .2em. Changing the font-size on the track changes its computed height in Firefox. Unlike in the case of the width, Chrome allows the track to take the height we set and, if we're not using a % value here, it also makes the content-box of the parent slider expand or shrink such that the border-box of the track perfectly fits in it. When using a % value, the actual slider and the track are middle aligned vertically. Explicitly setting a height on the track in % changes the height of the track in Chrome, but not that of the parent slider. Using other units, the actual range input expands or shrinks vertically such that the track perfectly fits inside. The computed value we get for the height without setting any custom styles is the same as for the slider and doesn't change with the font-size. Changing the font-size on the track doesn't change its computed height in Chrome. What about Edge? Well, we can change the height of the track independently of that of the parent slider and they both stay middle aligned vertically, but all of this is only as long as the track height we set is smaller than the initial height of the actual input. Above that, the track's computed height is always equal to that of the parent range. Explicitly setting a height on the track in Edge doesn't change the height of the parent slider and the two are middle aligned. However, the height of the track is limited by that of the actual input. The initial track height is 11px and this value doesn't depend on the font-size or on the viewport. Changing the font-size on the track doesn't change its computed height in Edge. Moving on to something less mindbending, we have box-sizing. 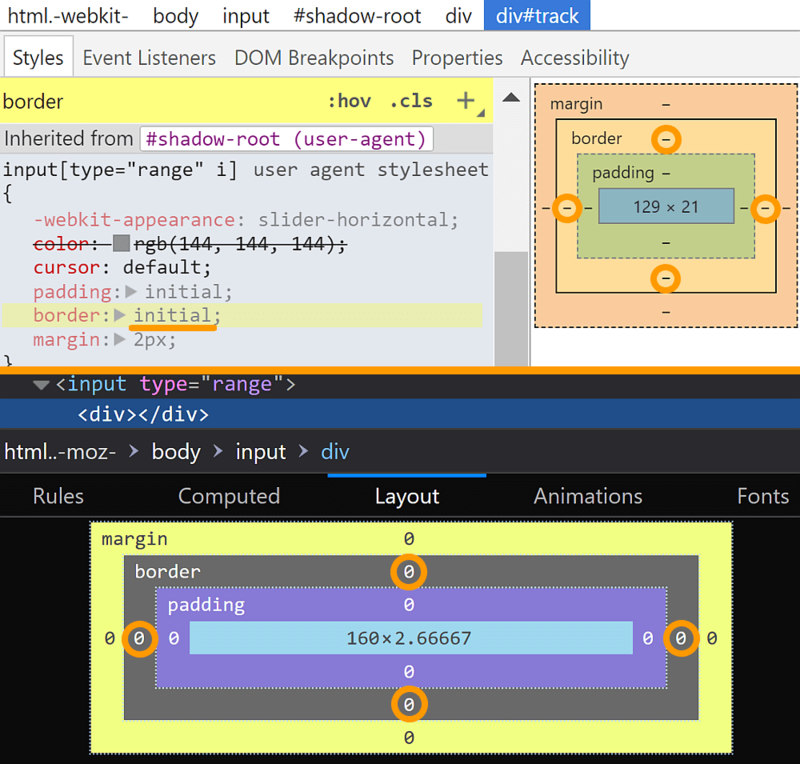 This is border-box in Chrome and content-box in Edge and Firefox so, if we're going to have a non-zero border or padding, then box-sizing is a property we need to explicitly set in order to even things out. The box-sizing of the track, comparative look at all three browsers (from top to bottom: Chrome, Firefox, Edge). The default track margin and padding are both 0 in all three browsers - finally, an oasis of consistency! The values for the color property can be inherited from the parent slider in all three browsers. 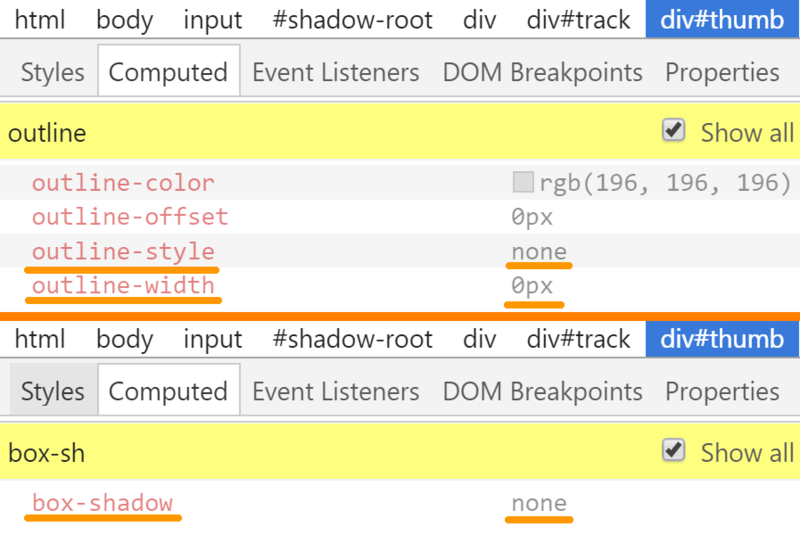 The color of the track, comparative look at Chrome (top) and Firefox (bottom). Even so, Edge is the odd one here, changing it to white, though setting it to initial changes it to black, which is the value we have for the actual input. Resetting the color to initial in Edge. 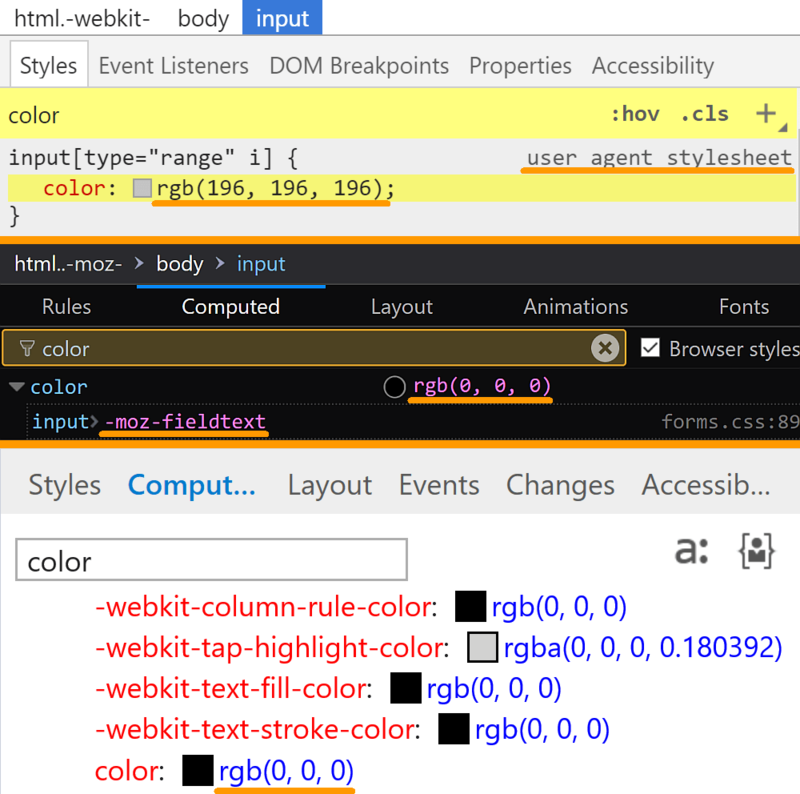 Setting -webkit-appearance: none on the actual input in Edge makes the computed value of the color on the track transparent (if we haven't explicitly set a color value ourselves). Also, once we add a background on the track, the computed track color suddenly changes to black. Unexpected consequence of adding a background track in Edge. To a certain extent, the ability to inherit the color property is useful for theming, though inheriting custom properties can do a lot more here. For example, consider we want to use a silver for secondary things and an orange for what we want highlighted. We can define two CSS variables on the body and then use them across the page, even inside our range inputs. Sadly, while this works in Chrome and Firefox, Edge doesn't currently allow custom properties on the range inputto be inherited down to its components. Expected result (left) vs. result in Edge (right), where no track or thumb show up (live demo). By default, there is no border on the track in Chrome or Firefox (border-width is 0 and border-style is none). 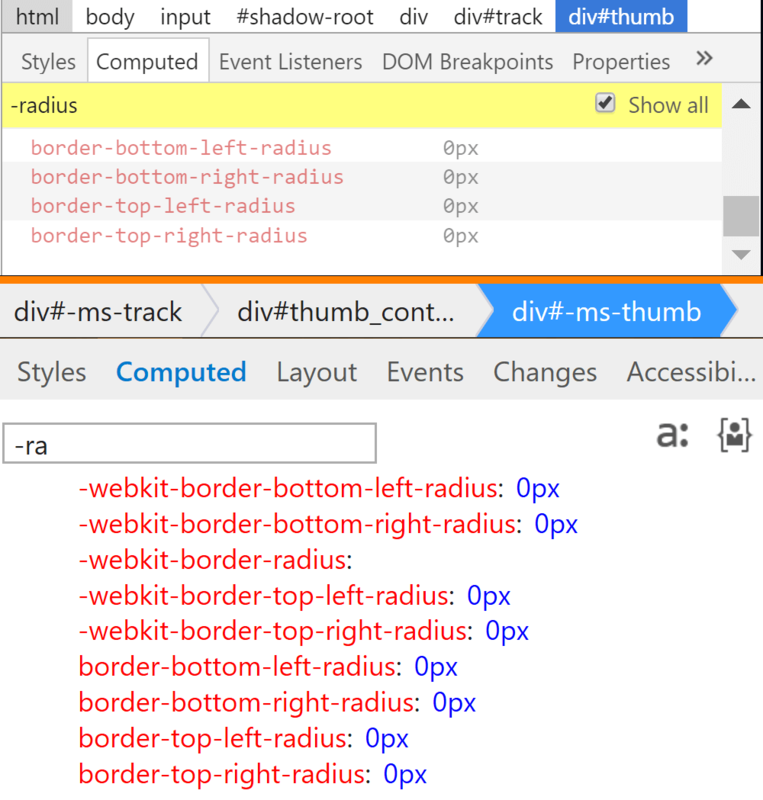 The border of the track, comparative look at Chrome (top) and Firefox (bottom). Edge has no border on the track if we have no background set on the actual input and no background set on the track itself. However, once that changes, we get a thin (1px) black track border. Another unexpected consequence of adding a track or parent slider background in Edge. The default background-color is shown to be inherited as white, but then somehow we get a computed value of rgba(0,0,0,0) (transparent) in Chrome (both before and after -webkit-appearance: none). This also makes me wonder how come we can see the track before, since there's no background-color or background-image to give us anything visible. Firefox gives us a computed value of rgb(153,153,153) (#999) and Edge transparent (even though we might initially think it's some kind of silver, that is not the background of the ::-ms-track element - more on that a bit later). The background-color of the track, comparative look at all three browsers (from top to bottom: Chrome, Firefox, Edge). Ready for the most annoying inconsistency yet? The thumb moves within the limits of the track's content-box in Chrome and within the limits of the actual input's content-box in Firefox and Edge, even when we make the track longer or shorter than the input (Chrome doesn't allow this, forcing the track's border-box to fit the slider's content-box horizontally). Recording of the thumb motion in Chrome from one end of the slider to the other. The padding is transparent, while the content-box and the border are semitransparent. We've used orange for the actual slider, red for the track and purple for the thumb. Recording of the thumb motion in Firefox from one end of the slider to the other (the three cases from top to bottom: the border-box of the track perfectly fits the content-box of the slider horizontally, it's longer and it's shorter). In Chrome, the thumb is the child of the track, while in Firefox it's its sibling, so, looking at it this way, it makes sense that Chrome would move the thumb within the limits of the track's content-box and Firefox would move it within the limits of the slider's content-box. However, the thumb is inside the track in Edge too and it still moves within the limits of the slider's content-box. Recording of the thumb motion in Edge from one end of the slider to the other (the three cases from top to bottom: the border-box of the track perfectly fits the content-box of the slider horizontally, it's longer and it's shorter). While this looks very strange at first, it's because Edge forces the position of the track to static and we cannot change that, even if we set it to relative with !important. Trying (and failing) to change the value of the position property on the track in Edge. This means we may style our slider exactly the same for all browsers, but if its content-box doesn't coincide to that of its track horizontally (so if we have a non-zero lateral padding or border on the track), it won't move within the same limits in all browsers. Furthermore, if we scale the track horizontally, then Chrome and Firefox behave as they did before, the thumb moving within the limits of the now scaled track's content-box in Chrome and within the limits of the actual input's content-box in Firefox. However, Edge makes the thumb move within an interval whose width equals that of the track's border-box, but starts from the left limit of the track's padding-box, which is probably explained by the fact that the transform property creates a stacking context. Recording of the thumb motion in Edge when the track is scaled horizontally. Vertically, the thumb is middle-aligned to the track in Firefox, seemingly middle-aligned in Edge, though I've been getting very confusing different results over multiple tests of the same situation, and the top of its border-box is aligned to the top of the track's content-box in Chrome once we've set -webkit-appearance: none on the actual input and on the thumb so that we can style the slider. While the Chrome decision seems weird at first, is annoying in most cases and lately has even contributed to breaking things in... Edge (but more about that in a moment), there is some logic behind it. By default, the height of the track in Chrome is determined by that of the thumb and if we look at things this way, the top alignment doesn't seem like complete insanity anymore. However, we often want a thumb that's bigger than the track's height and is middle aligned to the track. We can correct the Chrome alignment with margin-top in the styles we set on the ::-webkit-slider-thumb pseudo. Unfortunately, this way we're breaking the vertical alignment in Edge. This is because Edge now applies the styles set via ::-webkit-slider-thumb as well. At least we have the option of resetting margin-top to 0 in the styles we set on ::-ms-thumb. The demo below shows a very simple example of this in action. See the Pen by thebabydino (@thebabydino) on CodePen. Just like in the case of the track, the value of the box-sizing property is border-box in Chrome and content-box in Edge and Firefox, so, for consistent results across browsers, we need to set it explicitly if we want to have a non-zero border or padding on the thumb. The margin and padding are both 0 by default in all three browsers. After setting -webkit-appearance: none on both the slider and the thumb (setting it on just one of the two doesn't change anything), the dimensions of the thumb are reset from 10x21 (dimensions that don't depend on the font-size) to 129x0 in Chrome. The height of the track and actual slider also get reset to 0, since they depend on that of their content (the thumb inside, whose height has become 0). The thumb box model in Chrome. This is also why explicitly setting a height on the thumb makes the track take the same height. According to Chrome DevTools, there is no border in either case, even though, before setting -webkit-appearance: none, it sure looks like there is one. How the slider looks in Chrome before setting -webkit-appearance: none. If that's not a border, it might be an outline or a box-shadow with no blur and a positive spread. 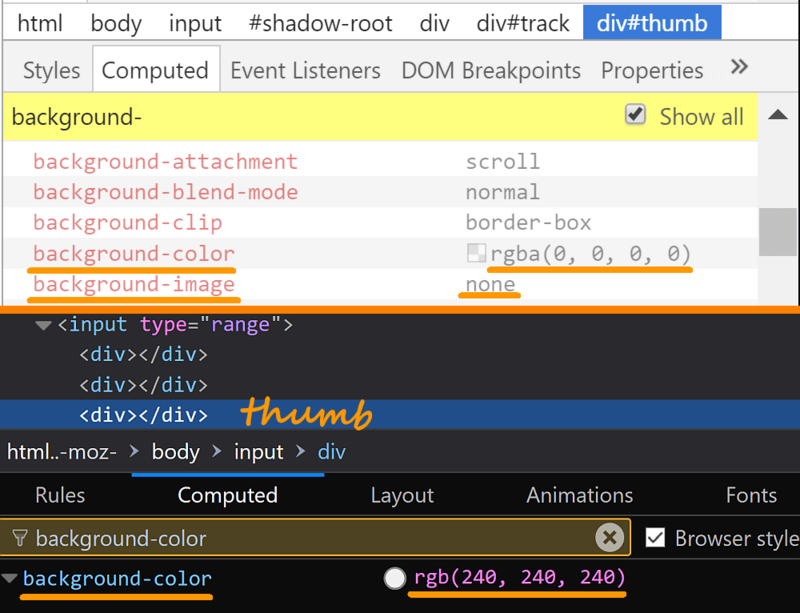 But, according to Chrome DevTools, we don't have an outline, nor box-shadow on the thumb. 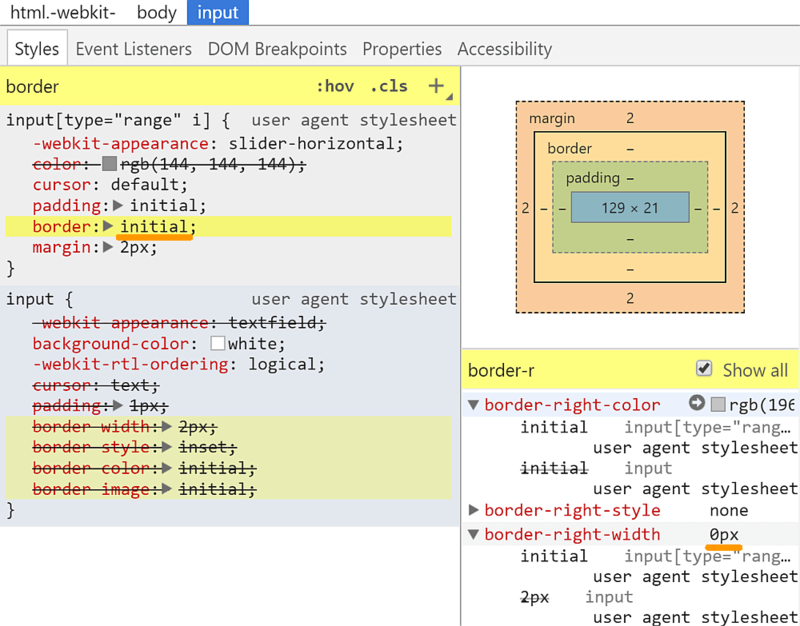 Computed values for outline and box-shadow in Chrome DevTools. Setting -webkit-appearance: none in Edge makes the thumb dimensions go from 11x11 (values that don't depend on the font-size) to 0x0. Explicitly setting a height on the thumb makes the track take the initial height (11px). The thumb box model in Edge. In Edge, there's initially no border on the thumb. However, after setting a background on either the actual range input or any of its components, we suddenly get a solid 1px white lateral one (left and right, but not top and bottom), which visually turns to black in the :active state (even though Edge DevTools doesn't seem to notice that). Setting -webkit-appearance: none removes the border-width. The thumb border in Edge. In Firefox, without setting a property like background on the range input or its components, the dimensions of the thumb are 1.666x3.333 and, in this case, they don't change with the font-size. However, if we set something like background: transparent on the slider (or any background value on its components), then both the width and height of the thumb become 1em. The thumb box model in Firefox. In Firefox, if we are to believe what we see in DevTools, we initially have a solid thick grey (rgb(153, 153, 153)) border. 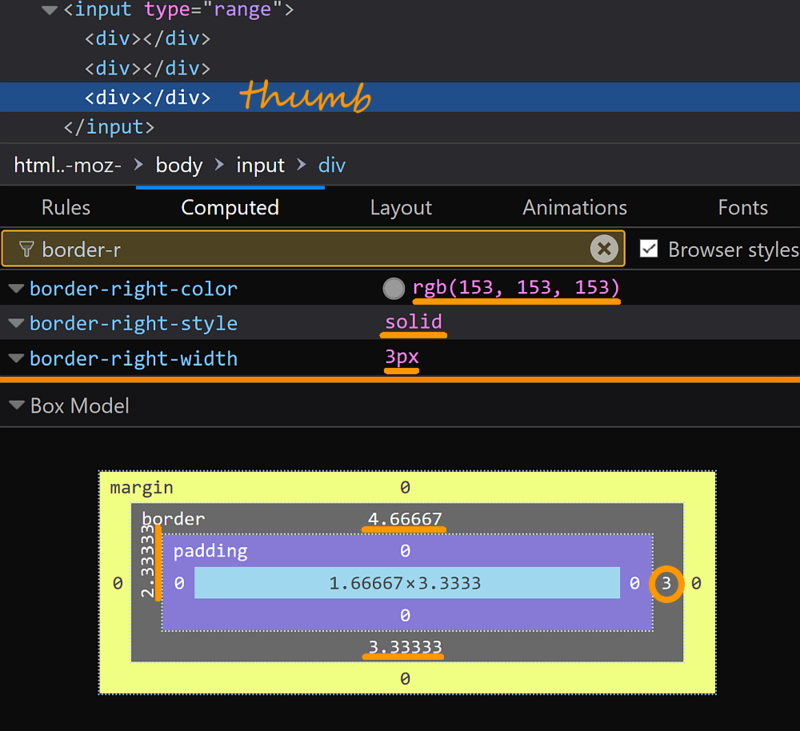 The thumb border in Firefox DevTools. Visually however, I can't spot this thick grey border anywhere. How the slider looks initially in Firefox, before setting a background on it or on any of its components. After setting a background on the actual range input or one of its components, the thumb border actually becomes visually detectable and it seems to be .1em. The thumb border in Firefox. In Chrome and in Edge, the border-radius is always 0. The thumb border-radius in Chrome (top) and Edge (bottom). In Firefox however, we have a .5em value for this property, both before and after setting a background on the range input or on its components, even though the initial shape of the thumb doesn't look like a rectangle with rounded corners. The thumb border-radius in Firefox. 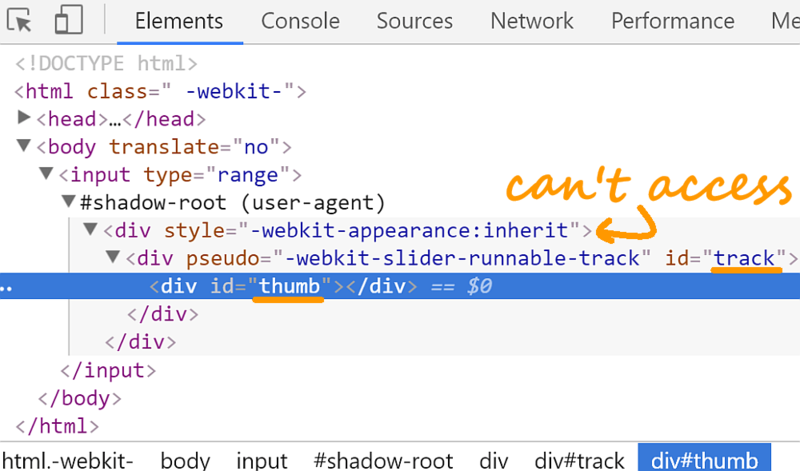 The strange initial shape of the thumb in Firefox has made me wonder whether it doesn't have a clip-path set, but that's not the case according to DevTools. The thumb clip-path in Firefox. More likely, the thumb shape is due to the -moz-field setting, though, at least on Windows 10, this doesn't make it look like every other slider. 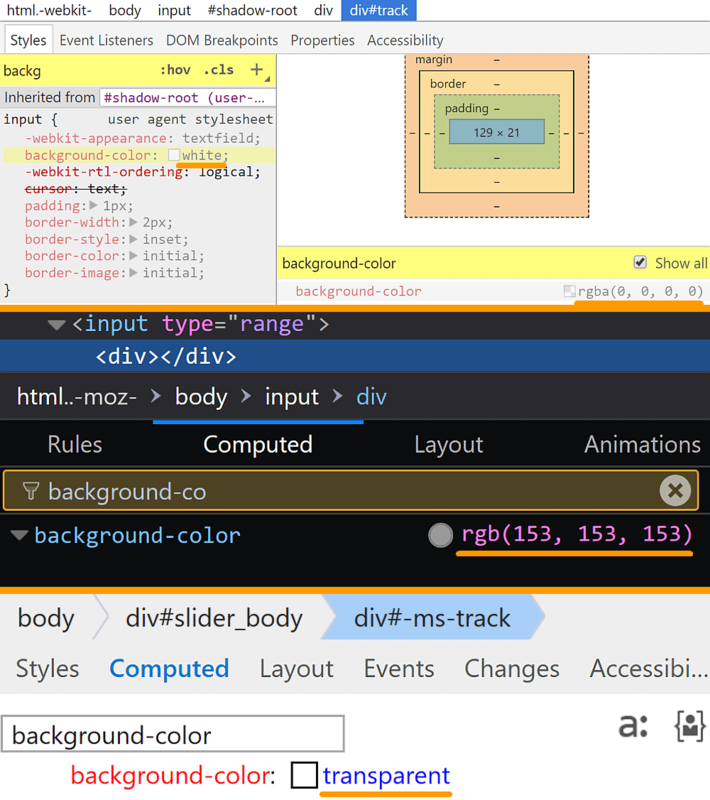 Initial appearance of slider in Firefox vs. appearance of a native Windows 10 slider. The thumb's background-color is reported as being rgba(0, 0, 0, 0) (transparent) by Chrome DevTools, even though it looks grey before setting -webkit-appearance: none. We also don't seem to have a background-image that could explain the gradient or the lines on the thumb before setting -webkit-appearance: none. 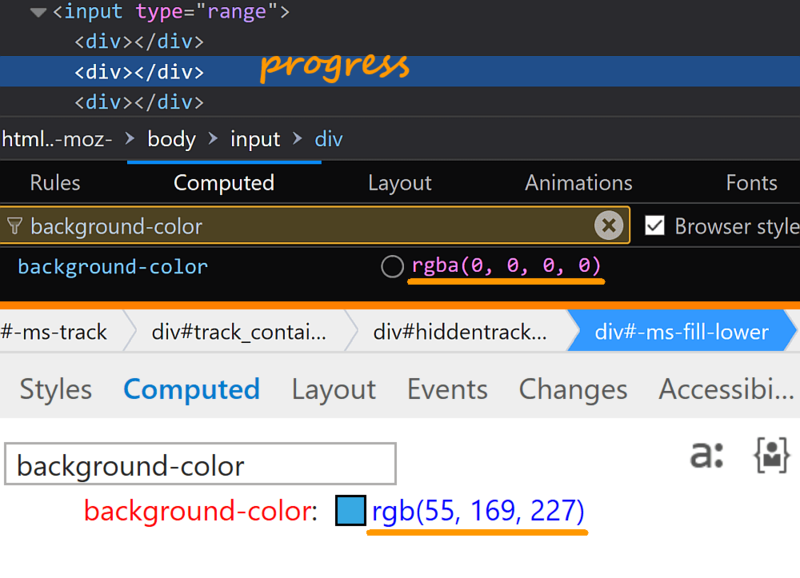 Firefox DevTools reports it as being rgb(240, 240, 240), even though it looks blue as long as we don't have a background explicitly set on the actual range input or on any of its components. The thumb background-color in Chrome (top) and Firefox (bottom). In Edge, the background-color is rgb(33, 33, 33) before setting -webkit-appearance: none and transparent after. The thumb background-color in Edge. We only have dedicated pseudo-elements for this in Firefox (::-moz-range-progress) and in Edge (::-ms-fill-lower). Note that this element is a sibling of the track in Firefox and a descendant in Edge. This means that it's sized relative to the actual input in Firefox, but relative to the track in Edge. In order to better understand this, consider that the track's border-box perfectly fits horizontally within the slider's content-box and that the track has both a border and a padding. In Firefox, the left limit of the border-box of the progress component always coincides with the left limit of the slider's content-box. When the current slider value is its minimum value, the right limit of the border-box of our progress also coincides with the left limit of the slider's content-box. When the current slider value is its maximum value, the right limit of the border-box of our progress coincides with the right limit of the slider's content-box. This means the width of the border-box of our progress goes from 0 to the width of the slider's content-box. In general, when the thumb is at x% of the distance between the two limit value, the width of the border-box for our progress is x% of that of the slider's content-box. This is shown in the recording below. The padding area is always transparent, while the border area and content-box are semitransparent (orange for the actual input, red for the track, grey for the progress and purple for the thumb). How the width of the ::-moz-range-progress component changes in Firefox. In Edge however, the left limit of the fill's border-box always coincides with the left limit of the track's content-box while the right limit of the fill's border-box always coincides with the vertical line that splits the thumb's border-box into two equal halves. This means that when the current slider value is its minimum value, the right limit of the fill's border-box is half the thumb's border-box to the right of the left limit of the track's content-box. And when the current slider value is its maximum value, the right limit of the fill's border-box is half the thumb's border-box to the left of the right limit of the track's content-box. This means the width of the border-box of our progress goes from half the width of the thumb's border-box minus the track's left border and padding to the width of the track's content-box plus the track's right padding and border minus half the width of the thumb's border-box. In general, when the thumb is at x% of the distance between the two limit value, the width of the border-box for our progress is its minimum width plus x% of the difference between its maximum and its minimum width. How the width of the ::-ms-fill-lower component changes in Edge. While the description of the Edge approach above might make it seem more complicated, I've come to the conclusion that this is the best way to vary the width of this component as the Firefox approach may cause some issues. For example, consider the case when we have no border or padding on the track for cross browser consistency and the height of the both the fill's and thumb's border-box equal to that of the track. Furthermore, the thumb is a disc (border-radius: 50%). How our example works in Edge. How our example works in Firefox. The good news is that we don't have other annoying and hard to get around inconsistencies in the case of this component. box-sizing has the same computed value in both browsers - content-box. 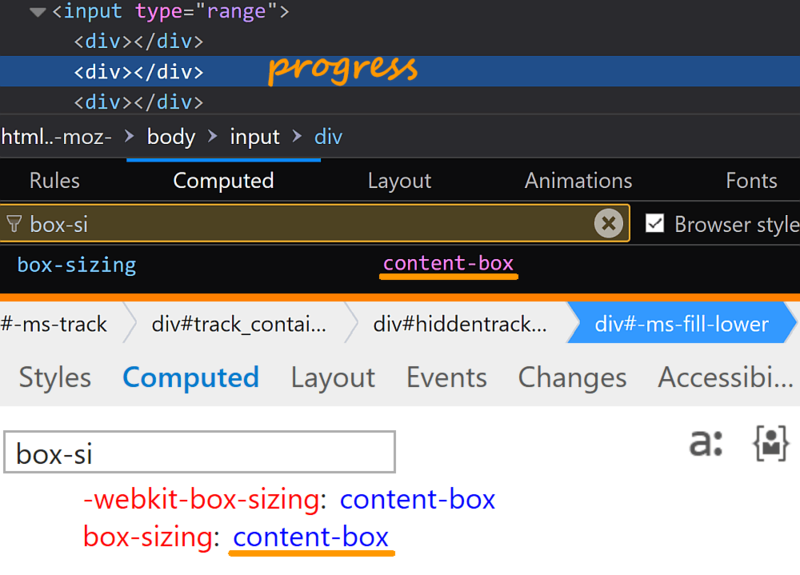 The computed value for box-sizing in the case of the progress (fill) component: Firefox (top) and Edge (bottom). 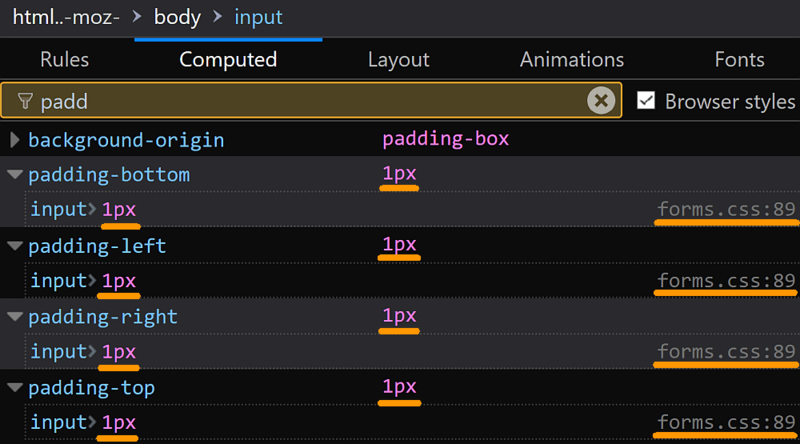 In Firefox, the height of the progress is .2em, while the padding, border and margin are all 0. The height of the progress in Firefox. In Edge, the fill's height is equal to that of the track's content-box, with the padding, border and margin all being 0, just like in Firefox. The height of the fill in Edge. Initially, the background of this element is rgba(0, 0, 0, 0) (transparent, which is why we don't see it at first) in Firefox and rgb(0, 120, 115) in Edge. The background-color of the progress (fill) in Firefox (top) and Edge (bottom). In both cases, the computed value of the color property is rgb(0, 0, 0) (solid black). 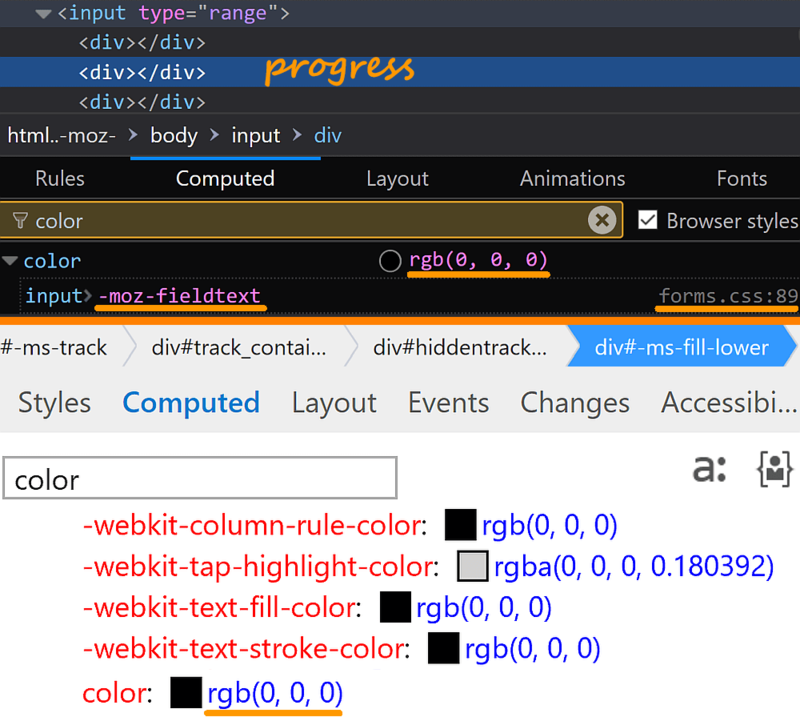 The computed value for color in the case of the progress (fill) component: Firefox (top) and Edge (bottom). WebKit browsers don't provide such a component and, since we don't have a way of accessing and using a track's ::before or ::after pseudos anymore, our only option of emulating this remains layering an extra, non-repeating background on top of the track's existing one for these browsers and making the size of this extra layer along the x axis depend depend on the current value of the range input. The simplest way of doing this nowadays is by using a current value --val CSS variable, which holds the slider's current value. We update this variable every time the slider's value changes and we make the background-size of this top layer a calc() value depending on --val. This way, we don't have to recompute anything when the value of the range input changes - our calc() value is dynamic, so updating the --val variable is enough (not just for this background-size, but also for other styles that may depend on it as well). Also doing this for Firefox is an option if the way ::-moz-range-progress increases doesn't look good for our particular use case. Edge also provides a ::-ms-fill-upper which is basically the complementary of the lower one and it's the silver background of this pseudo-element that we initially see to the right of the thumb, not that of the track (the track is transparent). Edge is the only browser that shows tick marks by default. They're shown on the track, delimiting two, five, ten, twenty sections, the exact number depending initially on the track width. 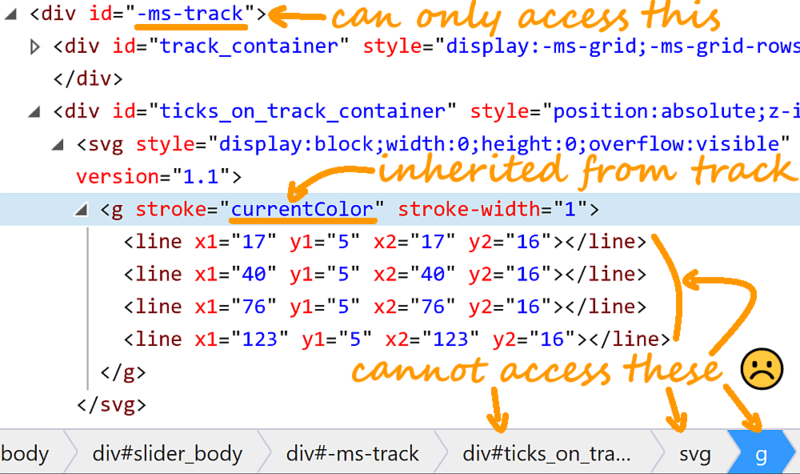 The only style we can change for these tick marks is the color property as this is inherited from the track (so setting color: transparent on the track removes the initial tick marks in Edge). The structure that generates the initial tick marks on the track in Edge. The spec says that tick marks and labels can be added by linking a datalist element, for whose option children we may specify a label attribute if we want that particular tick mark to also have a label. Unfortunately, though not at all surprising anymore at this point, browsers have a mind of their own here too. Firefox doesn't show anything - no tick marks, no labels. Chrome shows the tick marks, but only allows us to control their position along the slider with the option values. It doesn't allow us to style them in any way and it doesn't show any labels. Also, setting -webkit-appearance: none on the actual slider (which is something that we need to to in order to be able to style it) makes these tick marks disappear. Edge joins the club and doesn't show any labels either and it doesn't allow much control over the look of the ticks either. While adding the datalist allows us to control which tick marks are shown where on the track, we cannot style them beyond changing the color property on the track component. In Edge, we also have ::-ms-ticks-before and ::-ms-ticks-after pseudo-elements. These are pretty much what they sound like - tick marks before and after the track. However, I'm having a hard time understanding how they really work. They're hidden by display: none, so changing this property to block makes them visible if we also explicitly set a slider height, even though doing this does not change their own height. How to make tick marks crested by ::-ms-ticks-after visible in Edge. Beyond that, we can set properties like margin, padding, height, background, color in order to control their look. However, I have no idea how to control the thickness of individual ticks, how to give individual ticks gradient backgrounds or how to make some of them major and some minor. So, at the end of the day, our best option if we want a nice cross-browser result remains using repeating-linear-gradient for the ticks and the label element for the values corresponding to these ticks. Edge is the only browser that provides a tooltip via ::-ms-tooltip, but this doesn't show up in the DOM, cannot really be styled (we can only choose to hide it by setting display: none on it) and can only display integer values, so it's completely useless for a range input between let's say .1 and .4 - all the values it displays are 0! ::-ms-tooltip when range limits are both subunitary. So our best bet is to just hide this and use the output element for all browsers, again taking advantage of the possibility of storing the current slider value into a --val variable and then using a calc() value depending on this variable for the position. The good news is that every browser allows us to create vertical sliders. The bad news is, as you may have guessed... every browser provides a different way of doing this, none of which is the one presented in the spec (setting a width smaller than the height on the range input). 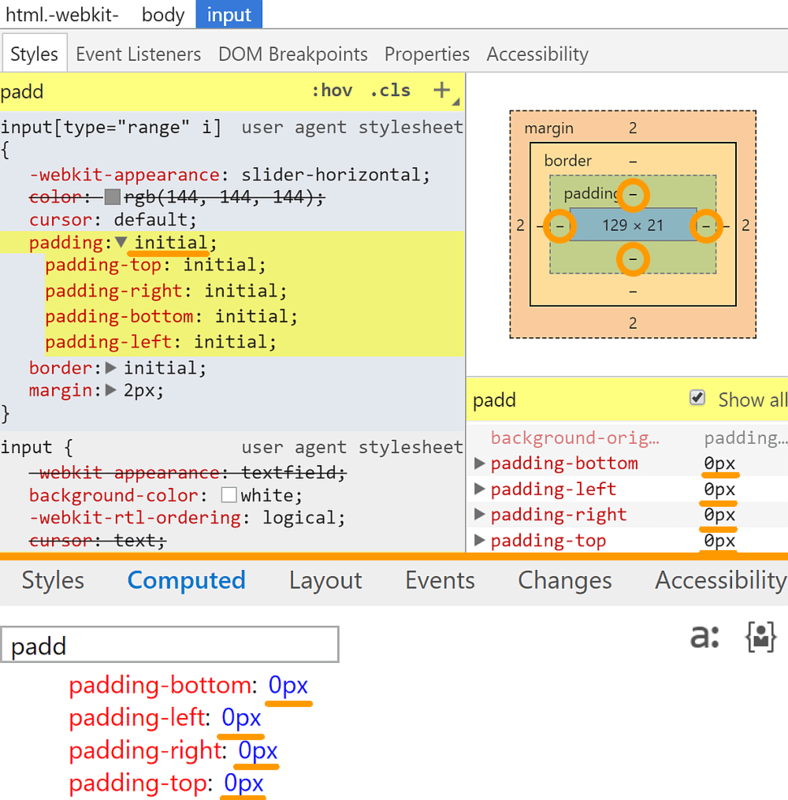 WebKit browsers have opted for -webkit-appearance: slider-vertical, Edge for writing-mode: bt-lr, while Firefox controls this via an orient attribute with a value of 'vertical'. The really bad news is that, for WebKit browsers, making a slider vertical this way leaves us unable to set any custom styles on it (as setting custom styles requires a value of none for -webkit-appearance). Our best option is to just style our range input as a horizontal one and then rotate it with a CSS transform. Wow! You’ve really done yeoman’s work here, sussing out all the variations and coming up with a workable (if not so elegant) solution in most common browsers. Major props for your hard work and thorough write-up. Off-topic, and I’m new around here so forgive me if the answer is obvious, but: what did you use to make those great image annotations? In particular, what is that nice handwritten font? Thanks! Paint 3D, I didn’t want to install anything new, so I tried to do with what I had that came with Windows. The font is Segoe Script. GREAT odin’s raven! This definitely took some work to put together. Thanks! In a way it’s probably good that each and every property needs to be set (where the browser is setting or inferring its own values)– for example one day I noticed that hovering over default (unstyled) buttons in my Firefox made them black background with the black text. Turns out it was because I’m using a I-have-crappy-eyes high contrast theme from my OS, and the backgrounds of buttons deal with this by switching, but the colour was set elsewhere (and so did NOT react with OS info on the text). I guess normally it would have, like in my other applications, turned the colour white. Of course chromium doesn’t listen to my OS settings so it’s something I notice with Firefox. If Edge is anything like IE, it should also be listening to the OS for stuff. So a good rule of thumb for developers who want to style things like form controls that like to look at the OS is to style ALL the things manually, when possible. That way at least your intended contrast remains. Nice, but comparing with real world sliders, this round handle has a pin in the middle, that goes down into the slider track. therefore handle logically should stop at [handleWidth/2 – trackHeight] beyond slider track. Anyway, good work! Hate these underdeveloped slider plugins.